Which writing prompts are you using? I’m also doing a month of writing about our loss– which is really fresh actually. We lost our Claire Joy at 18 weeks September 7th. She was born alive and died in our arms. I didn’t even know October was pregnancy and infant loss awareness month. I’ve never had something that I’ve felt so strongly about– we all need to take a stand together, and prove that we don’t have to suffer in silence. So sorry we belong to the same club. Even still, Praising God in this storm. Thank you for sharing. I’m actually not using a set of prompts. I’m planning on working through the story of her birth, and then several posts about what’s been like to go through a loss like this and how someone else might help someone who has experienced a loss. Looking at your blog, I’m planning on covering a lot of the prompts that you posted. I didn’t know that October was pregnancy and infant loss awareness loss month until about a week ago, but since it’s just been a little less than 8 weeks since losing her, I’m very, very new to all of this. I agree about feeling so strongly about giving voice to people experiencing a loss. I’m so sorry that loss is what connects us, but thankful that we both have the opportunity to speak truth about God’s love to people that experience loss or know someone who does. Praying for you as you write, and looking forward to writing through October with you. I know what you mean. It’s so fresh. I didn’t know about it, either. I don’t think it makes a huge impact on you, until it happens. Hoping you find comfort, and peace through your writing. It has been great to get it all out. So sorry for your loss. I lost two pregnancies this year. Our daughter, Cadence, would have been born last week. It was a tough milestone and I’m still struggling. I’ll be following your story. 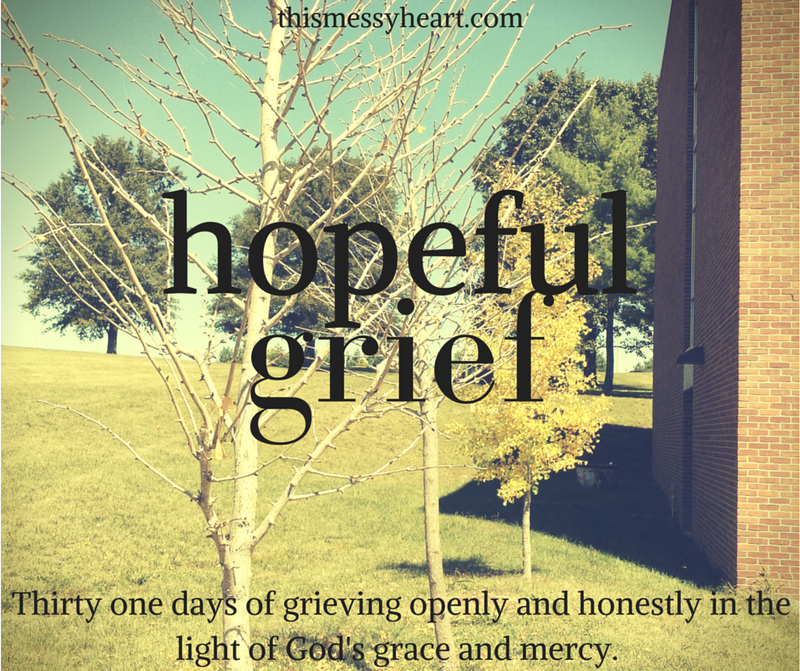 I really appreciate the title, Hopeful Grief, that’s what I want it to feel like. Jennifer, I’m so sorry to hear about your losses this year. Our daughter Cora was due on the 4th of November, and as that date comes, I can’t imagine what it’s going to be like for it to pass without her here. I pray that as you grieve Cadence’s loss, that God would be obviously ever-present. As I’m working on writing this series, I’m preaching to myself. I’m working every day to hopefully grieve instead of just grieving without hope. Because of my faith, I have to choose to trust God daily with my pain. Making that choice has never been so hard, or so necessary. I pray that we both are able to grieve hopefully as we move through life after loss. I’m so sorry for your loss. Words fail me, but I love your determined spirit. I’ll be following your journey, my friend and I’m saying a prayer for you. Senadoll, thank you so much. I appreciate your prayers greatly. Loss, I’ve found through this process, is impossible to address with words. I visited your blog, and appreciate that you shared your loss and are encouraging women to speak when they feel the need. Oh my goodness – I’m so very sorry for your loss! We lost a little girl (earlier – at the beginning of the second trimester) after a long ordeal with infertility, and the whole experience has definitely been a stake in the ground. I’m not the same person I used to be, but I consider some of the changes produced by our loss to be a beautiful gift our baby, Mara, gave to me. It takes courage to process and share your story openly, but I found it to be so healing. I hope you will, too! Thank you, Heidi! I’m so sorry that you lost your Mara, but I’m encouraged to hear that the growth that came from knowing her has been a blessing to you. I am not the same person, and am figuring out what that means day by day. When I started writing for this series, I wasn’t sure if I’d be ready to share by October for the Write31Days challenge, but I’ve been finding it healing too. Painful, but the kind of pain that happens when you take a bandaid off to let a wound heal properly.